McClellan Clan: Fun things to do. A few weeks ago the power on our street was out for a few hours. 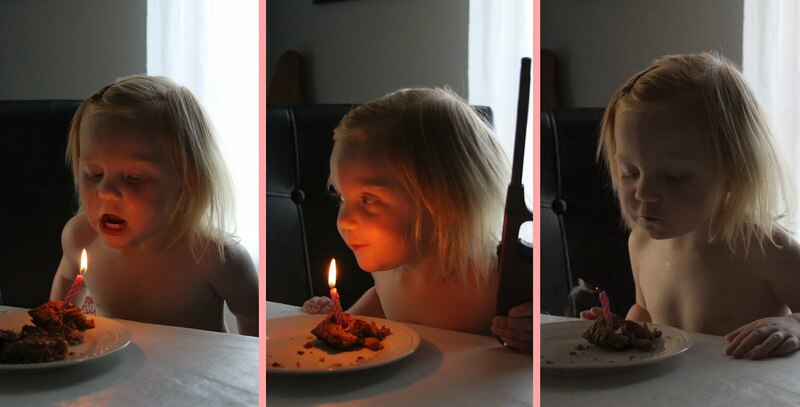 Hailey really liked all the candles we had burning. She was excited to help blow them out before we went to bed. 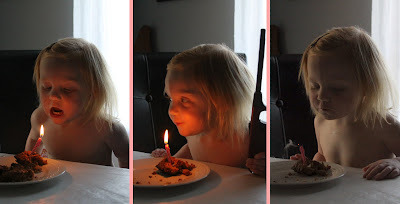 Ever since then we have let her "practice" blowing out candles so she will be ready for her birthday cake. Before she has even had breakfast or brushed her teeth she can't resist breaking out the Playdoh. We've learned that she's less likely to eat the Playdoh when she has a pacifier in her mouth. Recently she has been interested in painting and doing small crafts with colored paper, glue, and glitter. There was a large stash of art supplies in our garage just waiting to be used; it's one of the perks of having a dad who graduated from an art college. She loves to squeeze the paints out of their tubes into the palette. I had no idea watercolor paints even came in tubes. I just assumed they all came in those prepackaged Crayola sets. She has to be monitored or she gets too excited and wants to paint her body!